HP’s 24in and 36in ePrinters are fast, professional, web-connected and simple to use. The HP Designjet T520 610mm (24-inch) and 914mm (36-in) ePrinters have colour touchscreens, true print preview and convenient Wi-Fi connectivity. You can use your smartphone or tablet to access, view and print from virtually anywhere with HP’s Designjet ePrint & Share. We have been awarded the status of 'First Partner GOLD' by HP Inc who recognise we have the expertise and know-how to install, network, demonstrate and provide staff training for HP's entire Wide Format Printing portfolio. With the HP Designjet T520 ePrinter, you’ll achieve sharp, true-color prints of your designs, maps, photos, and presentations at resolutions up to 2400 dpi. Web/Wi-Fi connectivity means you can place the printer where it's most convenient. Produce prints up to 2400 dpi – Original HP inks deliver rich colours, sharp lines and fine details. Use HP media for optimal, reliable results. Process complex files at high speeds: get a D/A1 print in 35 seconds, thanks to 1 GB RAM and HP-GL/2 technology. Deliver architectural designs, maps, photos and presentations without sacrificing quality, thanks to Original HP inks. Reduce downtime and improve productivity – Original HP inks help you see consistent, outstanding results from the first print. Web connectivity and Wi-Fi certification. Up to 24-inch (610-mm) or 36-inch (910-mm) wide. Built-in tray, front roll and single sheet. 35 sec/page on A1/D, 70 A1/D prints per hour. Print resolution up to 2400 dpi. Original HP-GL/2 technology, HP-RTL drivers for Windows® (optimised for AutoCAD 2000 and higher); HP PCL 3 GUI driver for Mac OS X. The intuitive, full-colour, 109 mm (4.3-in) touchscreen simplifies navigation and lets you access and print files right from your printer. Rely on true print previews from the driver to complete your work quickly and accurately and prevent costly errors. Print documents up to 914 mm (36-in) wide, with a built-in B+/A3 tray and front-loading media roll. Easily set up your printer where you need it and connect everyone in your studio, thanks to built-in Wi-Fi. Print to your HP Designjet ePrinter from your laptop, Apple® or Android™ smartphone or tablet with HP Designjet ePrint and Share. 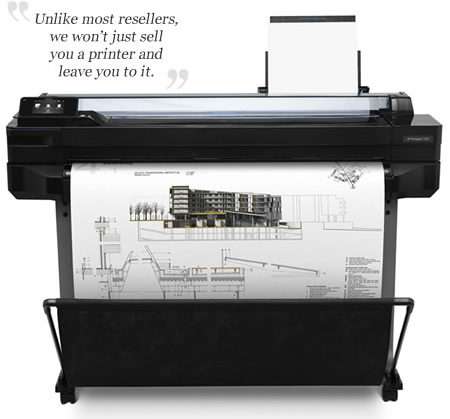 Access and print large-format projects when you're away from your studio, using HP Designjet ePrint and Share. Automatically save copies of your work to the cloud, and access them from virtually anywhere with HP Designjet ePrint and Share. Email projects to your HP Designjet T520 ePrinter and print, thanks to its web connectivity features.